1:6th scale. VL. 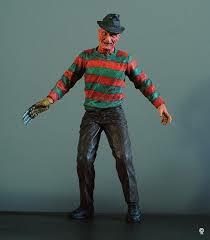 Model kit of Freddy Krueger from the 'Nightmare on Elm Street' series of movies. Produced in 1991 by Kaiyodo the model consists of 10 Vinyl parts moulded in a lovely bloody shade of Red! 1:6th scale. Vinyl. 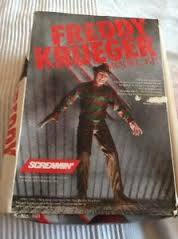 Made in Japan by Kaiyodo for Screamin' Products Inc. in 1992 the kit stands over 11" tall once built and has a poseable head, hands & arms as well as a removeable hat. In a full colour Screamin' box.